Page Authority Checker is a tool to calculate Page Authority score. The page authority checker identifies the algorithm using a machine learning model to show the best correlation within the SERP rankings. Check the page authority using a quality page authority checker also called PA checker, to see how your page stands up against the competition. This gives an idea of how much SEO you must do to improve the page authority for each individual pages of the website. Page Authority checker gives page authority in seconds. Page authority or PA is a score or metric developed by Moz. Page authority predicts the ability of a page to rank on SERP or Search Engine Result Page. The range of Page Authority scores is from 1 to 100. Pages with higher Page Authority have a greater ability to rank in the SERP. Successful webpages have high page authority. It is related to pages within the site and not the site itself. Each page on your site has a different score. Page authority is one of the key factor used for measuring your website ranking in search results. It provides very useful information on web page quality and strength to get overall page insight to be improved SEO against competitors. To calculate page authority you have to consider many factors like MozTrust, MozRank and so on. A machine learning model is used to identify an algorithm which best relates to the rankings across thousands of SERPs. You then have specific calculations to determine page authority. There are more than 40 factors considered to calculate page authority. You don’t necessarily use keywords and content optimization. What is Good Page Authority? Page authority is a relative score and not an absolute metric. It helps to determine which pages have more powerful link profiles when doing research on SERPs. The web page which gets the maximum number of hits on your website has a higher page authority compared to the other pages on your website. You may consider 30 to 60 to be good page authority. Page authority developed by Moz is a score which predicts how well a specific page in your website ranks on the SERP. The score ranges from 1 to 100. A higher page authority shows a higher ability to rank. It's easier to grow Page Authority score from 25 to 40 than 65 to 80. The algorithms used to calculate Page Authority score is regularly updated. This is why your Page Authority score fluctuates with time. It’s difficult to influence page authority score. Page Authority score is made up of a number of metrics (More than 40 in all), and each metric has an impact on page authority score. Let's understand what is MozRank. Moz has developed a metric called MozRank which gives the strength of external links to your site. MozRank shows the quality and quantity of links to your site. Google cares only about the quality of the links and not the quantity. This is why MozRank gives higher weight-age to quality and not the quantity of the links. It goes so far as to say, one high-quality link is as good as two low-quality links. MozRank is measured on a score from one to ten. MozTrust measures link your site has earned. MozTrust shows how closely your site is connected with trusted websites. These could be .edu and .gov sites. MozTrust is measured on a scale from one to ten. Google values high-quality content via social signals. If the content on your site has been shared, liked or commented on, it sends a strong social signal. Good quality content is readily shared, while poor quality content, sends no social signals. Why does page authority incorporate a number of metrics? Google takes into account a number of factors while ranking your page. This forces page authority to incorporate a lot of factors to give you the best possible result. After all the job of page authority is to predict how well your page will rank on Google SERP. How important is Page Authority Checker Tool? To understand the importance of page authority checker tool, you must first understand the goal of using the page authority checker tool. Page authority checker tool is a comparative tool. There’s no good and bad score here. The PA checker tool compares the page authority of the pages of your website vis-à-vis other websites. A good page authority reflects the ability of pages of your website to rank on search engine result page. Page authority is very important for link building. So what is link building? Link building is very simple. It’s the process of creating backlinks to your website. It's easy to get backlinks with good content. However, you can accelerate the process with link building. Backlinks are external links to your website, which help to index your website pages in a proper manner. Creating of backlinks (link building) increases traffic to your website. Now let's get to the next part. Page authority helps determine which pages have higher link profile. Each site which refers to your page transmits link authority. This is the vote of quality for your page. More votes mean a higher rank on SERP. Page authority checker tool tells if you need more SEO for your website. Page authority helps add value to each page of your website. More pages of your website earn value and move up in the Google SERP. A business in its initial years will have a page authority around 15-20. Page Authority score goes up as value is added to pages of the site. Page authority checker tool helps identify pages of your site which need value addition. Why we need the Page Authority Checker Tool? Page authority is very important to increase the visibility of the pages on your website. This increases the reach and thereby revenue and profits of the business. Page authority checker tool helps check page authority and show you where the business is heading. Page authority tells you which of the pages in your site have powerful link profile. 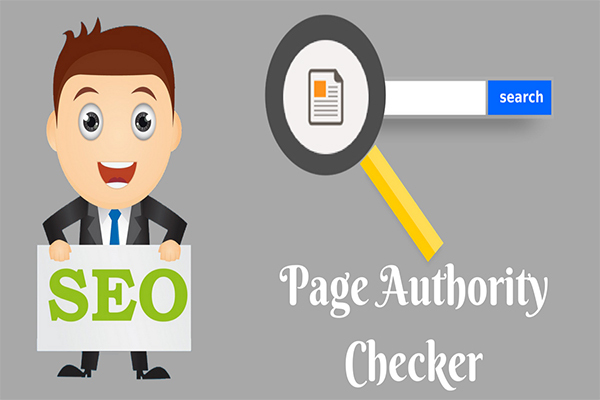 Page authority checker helps to find the page authority of pages of the site and you can improve page authority through link building. Page authority checker tool shows page authority and higher page authority increases the trustworthiness of the website. Consider page authority as a strong indicator of the trustworthiness of your website. Page authority checker tool gives page authority which helps you understand if certain inbound marketing strategies are working. So, how does this work? If one of your blog pages has low page authority, there’s something wrong somewhere. You got to do something about it. How to Improve Page Authority Score? There are no two ways about it. Content is King. If you want to increase page authority, create fresh content. For high page authority, create relevant good-quality content, relevant to your brand. Make sure to post good content regularly. Good content gets read, shared, commented and liked by readers. Other sites link to your page increasing page authority. Write interesting content with relevance to the subject. Don’t make the mistake of throwing some keywords, here and there. If your content is boring, it doesn’t send the right social signals. Nobody will read, like or share the content, which amounts to no links. Keep updating the content. Google loves relevant, up-to-date content. If the content is old, page authority would be low. Write content suitable for the target audience. Make content user-friendly. If your content is difficult to read, you will never get the right social signals. No one is going to read, share or like your content. Break up the content into smaller paragraphs. Put headings and bullet points wherever necessary. Use numbers to pass on, important information. Visuals like infographics and images break up the monotony of the text. You can’t get some external links. You have to earn them. When you write quality relevant content on one of your blog posts, a website posts a link. More and more people read the blog post, increasing traffic to your webpages. Write good content to earn links from quality websites. High-quality sites are an indicator of trust and quality. Promote your site on social media to increase exposure. This increases the chances of other sites, coming in contact with your high-quality content. Link blog posts to other authority sites. These websites take note of what you are doing and return the favor. This boosts page authority of the pages in your website. Write guest blogs for other sites which have relevance to your industry. This increases external links while helping build brand authority. Use images with original content to increase page authority. Images have a big impact on page authority. Find this tough to believe? More than 90% of the information transmitted to your brain is visual. Around 70% of the sensory receptors are in your eyes. Need more proof? Lots of written content may be tough to read. Blocks of text can be overwhelming to many readers. Images with their visual components, break the text up, making reading an enjoyable experience. A reader can easily scan through your page in seconds, and understand what the page is all about. Your viewers will share visual content, rather than written content. Let's say you post a link to content on social media pages. Make sure there’s an accompanying image, which makes your post stand out. This image would attract people to your post, who will follow the link to your page and read your content. Google wants images to complement your written content. Unfortunately, Google cannot identify your images unless you do this. Use descriptive ALT text which tells Google your images. There must be strong SEO in the ALT text. Google can easily find your images and this brings traffic to your website. First, it is necessary to increase content on the required web page. Add more internal links and external links in the webpage using anchor text. Have the content with good readability and understand-ability with clear step by step information. More images with alternate text and right SEO keywords to increase SEO visibility. Decrease bounce rate by providing valuable information. Page authority tells about individual pages how well optimized SEO factor like good interlinking, necessary strong outbound links, quality unique content, social media links, domain authority, etc. If the page has a strong link juice against competitors, the site will rank for a longer period of time in search results. Basically page authority formula build with a complex algorithm to identify all the key metrics on the webpage available or not. It is calculated from 0-100 using scale graph. How to use Page Authority Checker tool? Page authority checker tool helps check page authority with a single click. Please enter the URL you wish to analyze. You can paste up to 20 webpages to view page authority. Paste one URL on each line. All you have to do is paste the correct URL within the URL field, and click on the ‘Submit’ button. Page authority checker tool can give page authority of a specific URL. Page authority checker tool lets you know if there is any problem with page authority. You can find the number of linking root domains and the total number of links pointing to each page on Moz. If bad links point to your site, you suffer low page authority. Page authority checker identifies low page authority and you can remove bad links to improve the score. Page authority checker helps check fluctuations in Page Authority score. Changes with your links affect Page Authority score. If you have external links from trusted websites, you enjoy a high Page Authority score. There is another important benefit of page authority checker. Search engines like google notice if your website grows links much faster than others. If the search engine discovers you are growing links in a harmful way, your website is downgraded. Page authority checker detects low Page Authority scores, giving you time to rectify errors. Page authority checker helps determine the size and quality of backlink profiles. This shows the strength of your websites backlink profile, vis-à-vis rivals. Page authority checker helps to improve page authority which improves your chances to rank for relevant search terms.